Suicide Squad 2 just caught on fire. While production updates have been few and far between as of late, especially with Birds of Prey gearing up to shoot first, it has now been confirmed that James Gunn is in serious talks to write the DC Comics sequel. And if everything works out, he may even direct the movie. It hasn't been a good year for acclaimed filmmaker James Gunn. As we all know, the director was fired from Guardians of the Galaxy 3 in the wake of several offensive tweets he posted years ago resurfacing. Despite the insistence from the entire cast of the film for Gunn to keep his job, Disney wound up parting ways with Gunn, leaving his directorial future uncertain. 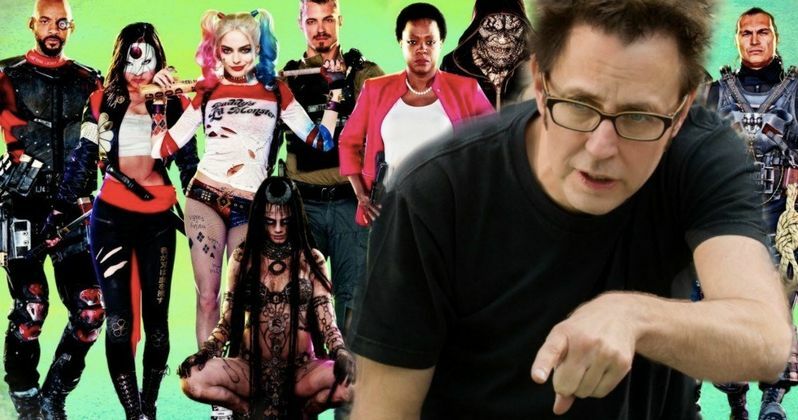 However, it's now being reported Gunn has been hired by Warner Bros. to write and possibly direct the upcoming follow-up film to Suicide Squad. While Gunn has signed on to pen the film's screenplay, he hasn't yet been confirmed to direct the project. However, these talks are reportedly ongoing, and the filmmaker could end up helming the sequel as well. It's possible these talks will proceed as Gunn pens the script, so WB and DC can see where the director plans on taking the franchise. Given his track record, however, there might be enough faith in Gunn to move forward with that decision, and there should be more information about these Suicide Squad 2 developments coming in the near future. It's no secret that the films in the DCEU are struggling to catch up to those in the MCU. Critically, most of the DC-based films to come out in recent years haven't been very well-received, and the original Suicide Squad is no exception. The studio has since branched out to produce films using DC characters not set in the DCEU, including the upcoming Joker, which stars Joaquin Phoenix as the titular villain. Given this new high-profile hiring, however, it remains clear that WB has big plans for the film universe they've created. Released in 2016, the original Suicide Squad was written and directed by David Ayer. The film featured an ensemble cast including Will Smith, Margot Robbie, Joel Kinnaman, Viola David, Jai Courtney, Cara Delevingne, and Jared Leto portraying a controversial version of Joker. The film did not fare too well with critics and has been often criticized, but was a big success regardless, grossing over $746 million worldwide. Considering Disney is still using Gunn's Guardians 3 script despite firing him as director, it's hard to deny his creative value as a writer, and bringing him on board should help restore interest in the sequel, despite the negative reviews of the prequel. Previously, Gavin O'Connor had been attached to direct Suicide Squad 2, but has since departed the project to focus on the Ben Affleck movie Torrance. This apparently opened the door for Gunn to step in as a director in addition to writing the film, and given that his schedule has completely cleared open, the stars just seemed to align perfectly for this to happen. Given that we'll likely never see Gunn directing another Marvel-based film, it seems appropriate for him to continue using his talents in the world of the superheroes. Maybe, just maybe, his creative touch can turn things around for the DCEU. This information comes to us courtesy of Deadline.